The Sustainable Communities Index (SCI) aims to offer a comprehensive best-practice set of performance measurement methods for livable, equitable, and prosperous cities. 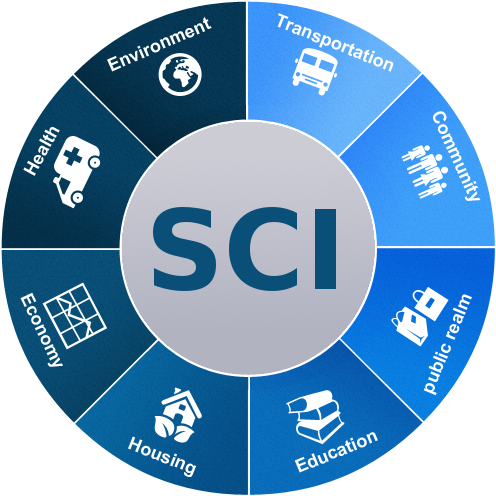 Any city may utilize the SCI measures and cities may also use the SCI weibsite to share views of their own city’s indicators. The SCI team will continue to monitor developments in the field of urban performance indicators and update the SCI measures so that they holitically reflect the needs of sustainable cities. Intense development pressures in San Francisco throughout the mid-late 1990’s and early 2000’s generated a multitude of infrastructure, zoning, public safety and environmental impacts, most especially a shortage of affordable housing. Many communities called on public health officials to evaluate the health impacts of these development pressures and advocate for healthy environments. 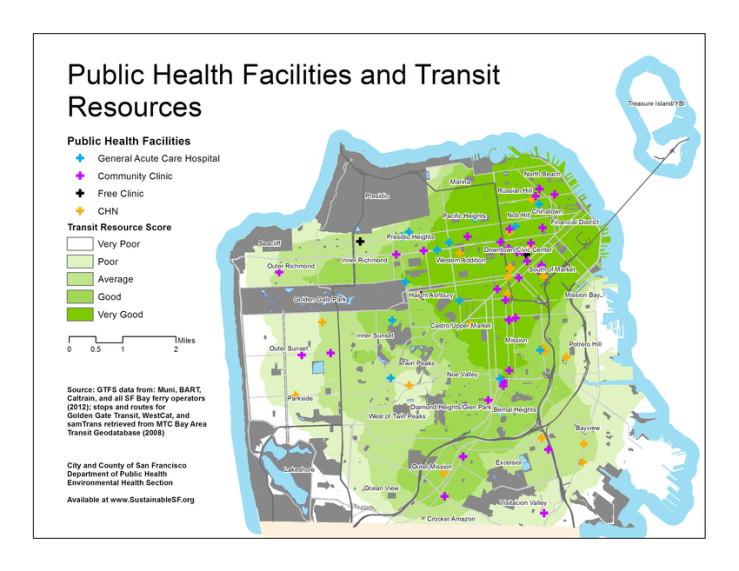 In response, the San Francisco Department of Public Health (SFDPH) initiated the Eastern Neighborhoods Community Health Impact Assessment (ENCHIA) to analyze how development in several San Francisco neighborhoods would affect attributes of social and physical environments that are most important to health. Facilitated and staffed by SFDPH, ENCHIA was guided by a multi-stakeholder Community Council of over 20 diverse organizations including community planning and design, economic and neighborhood development, environmental justice, homeless, open space, housing, transportation, bicycle, food systems, child care and childhood development advocates, low-wage and union workers, non-profit and private developers, property-owners, architects, and small businesses. ENCHIA was funded by SFDPH with in-kind contributions from the San Francisco Health Plan and other public agencies. The 18 month ENCHIA process resulted in a number of outcomes, including, 1) a Healthy City Vision for San Francisco, 2) community health objectives to reflect that vision, 3) indicators to measure those objectives, 4) data on those indicators to assess how the City was doing with respect to that vision, and, 5) a menu of urban development policy strategies to advance those objectives. Throughout the process, the Council identified the need to integrate much of the data and policy research that was being collected into a tool to support evidence-based and health-oriented planning and policy making. The Council felt that systematically applying a community health lens to planning on future development plans and projects would help achieve their social, environmental, economic, and equity priorities.For a complete history of the ENCHIA process, download the ENCHIA Final Report. The experience and research from the ENCHIA process was synthesized into the Healthy Development Measurement Tool (HDMT). The first version of the HDMT was launched on March 2007. Over twenty national technical experts from diverse disciplines such as land use and transportation planning, public health, health impact assessment, environmental impact assessment, and health equity, reviewed the first version. In addition, seven city agencies reviewed and provided feedback on the HDMT, including Planning, Redevelopment, Recreation and Parks, Arts Commission, Building Inspection, Public Works, Mayor’s Office of Community Development, and the Public Utilities Commission. The HDMT was subsequently applied to planning and development decisions in San Francisco between 2007 and 2012, leading to a number of refinement in the data and application methods. The measurment methods in the HDMT have been used and adapted by a number of cities including Richmond, California, Denver, Colorado, Galveston, Texas, Oakland, California, Philadelphia, Pennsylvania and Geneva, Switzerland. Recogniing the broad relevence of these measures for urban sustainability and civic engagement, in 2012, we launched the Sustainable Communities Index (SCI), building from the work of the HDMT, to provide an open-source international platform for the best practices in urban sustainability indicators.